I saw in the KC Star this morning that the last KC Masterpiece restaurant (the one on Metcalf) is closing. About time - that place had been running on fumes for years, depending on visitors who were familiar with the sauce from their local grocery store as their only clientele. Now the tourists will have to go eat at Arthur's, Gates, Fiorello's or the other fine BBQ establishments where the rest of us eat. I ate there once, within a week of the restaurant's opening (back in the early 1980s, maybe) and was greatly disappointed. Never went back. The guy who created the sauce, Rich Davis, used to be a fairly frequent guest on Mike Murphy's morning radio talk show. Murphy promoted the restaurant's grand opening pretty heavily. Was in Independence this past July. Stayed at the Quality Inn and my grandson & I ate at Gates' place not far from the motel. 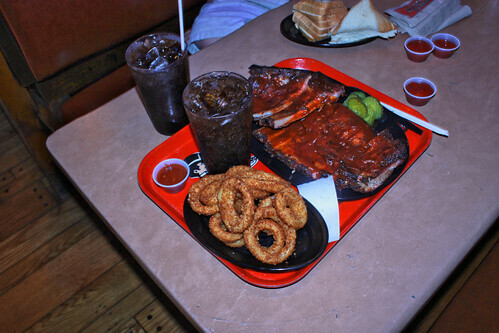 Once you got in past the cattle chutes, things got better, we ordered a slab of ribs and a order of onion rings. It was all we could do to eat it all. I gave it a 8 out of 10 and would eat there again given the chance. There are rummors that KC Masterpiece will reopen in Blue Springs. Tell you what, though; when that sauce hit the national supermarkets in the '70s it was a revelation. After years of nothing but Hunt's, here was something spicy and different! As with anything, interest usually sparks education, and education means learning what fake smoke tastes like and how to tell good "spicy and different" from mediocre "spicy and different". But it is still important to note the place that KC Masterpiece sauce holds in the sparking of the national interest in barbecue. For many of us, that is where it started. Dr. Rich was my friend Lynn's child psychologist. If their BBQ tastes as bad as their BBQ Sauce, it's a wonder they stayed in business this long! what tastes bad to you? I agree, FBM. But when that sauce hit the store shelves in the mid '70s, all store sauces tasted like tomato soup mixed with ketchup. Interest sparks education, and education brings knowledge. All I'm doing is giving KC Masterpiece sauce credit for being the first; not for being the best, or even close to it. When Rich Davis owned the sauce company, it was a better sauce. Davis used to boast to Mike Murphy, a local radio talk-show host, that Masterpiece used no corn syrup, only real molasses. Now, it's mostly corn syrup, I think, and it has a kind of chemical taste that it didn't have 20 years ago. Personally, I prefer Sweet Baby Ray's. I did use K.C Masterpiece back in the day when there was only Kraft and Hunts on the store shelves. I thought it was a nice break from the bland sauces that were out there. Now there are so many sauces on the market that I have a hard time deciding what I want to try next.